Razor clams: poisoning can cause diarrhea, amnesia, and death. The shell of a Pacific razor clam. Unlike the flashing blue-ringed octopus or the smelly rubbish bird, the Pacific razor clam isn’t in-your-face poisonous. 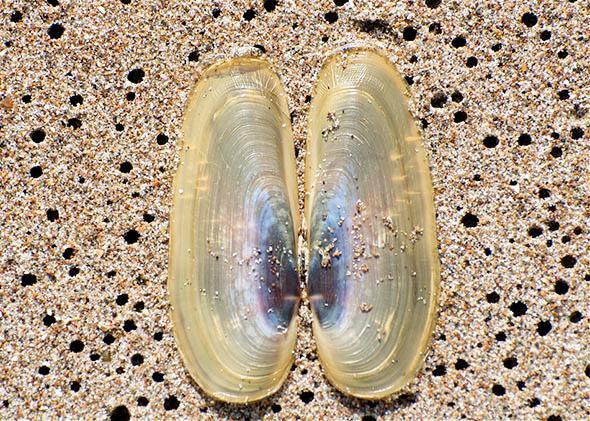 This narrow-bodied clam quietly dwells along beaches from California to Alaska, diligently filtering algae from the ocean. Usually, the clam’s not poisonous: Humans and wildlife both enjoy its “particularly delicious” flesh. But under certain conditions, the clam’s flesh harbors domoic acid, causing diarrhea, amnesia, and even death. The conditions that turn this savory clam toxic are becoming more widespread—and we humans are to blame. Domoic acid is just one of many biotoxins that accumulate in fish and shellfish. These marine biotoxins kill 900 people and poison 60,000 every year, on top of poisoning wildlife. They also exact an economic cost: When shellfish become toxic, the harvesting bans threaten the $77 million worth of shellfish sales in Washington state alone. Even worse, new research shows that people and wildlife may suffer from a different form of poisoning when they eat shellfish contaminated with domoic acid below the legal limit. But to understand domoic acid, we have to travel back to California 54 years ago to an outbreak of seabird madness witnessed by Alfred Hitchcock, who would subsequently produce The Birds. On Aug. 18, 1961, thousands of “crazed seabirds pelted the shores of North Monterey Bay,” regurgitating anchovies, flying into buildings, and dying on the streets. Over the following decades, scientists blamed similar outbreaks on oil spills, overfishing, and fog. But in 1987, 107 people in Canada fell ill with vomiting and diarrhea. One in 4 developed problems with short-term memory. The sickest became aggressive, cried uncontrollably, and had seizures. Sadly, three died of this new syndrome—amnesic shellfish poisoning. It turned out that the victims had eaten mussels grown at Prince Edward Island. And like the California anchovies, these mussels were contaminated with a novel neurotoxin: domoic acid. But how had domoic acid gotten into the seafood? The same way it got into humans—through the diet. Razor clams, mussels, and anchovies eat microscopic algae. When the ocean warms and fills with extra nutrients, these conditions trigger a “bloom” of algae like Pseudo-nitzchia, which makes domoic acid. The domoic acid accumulates in the shellfish. Even when the bloom stops, razor clams harbor concentrated domoic acid for almost a year. While domoic acid doesn’t faze shellfish, it does poison their predators. In 1991, approximately 290 Monterey Bay pelicans and cormorants died from a mass poisoning. In 1998, blooms off Monterey Bay caused a 350 percent increase in seabird deaths. Those blooms also inflicted an epidemic of seizures on more than 400 California sea lions. When scientists necropsied the sea lions, they found similarities to human victims: Neurons had died in their hippocampus, a part of the brain critical for memory. Domoic acid poisons the brain because it chemically resembles glutamate, a neurotransmitter used by brain cells to communicate. When mammals eat domoic acid, the toxin slips into the bloodstream and into the brain. It parks in the receptors meant for glutamate on the surfaces of neurons, stimulating the neuron to death. Brain regions with lots of glutamate receptors—like the hippocampus and the amygdala, which is involved in emotion and aggression—are especially susceptible. Thanks to monitoring of shellfish beds in Canada, Washington, Oregon, and California, there haven’t been other known human victims of amnesic shellfish poisoning since 1987. But scientists are concerned that, while the regulatory limit on domoic acid protects people from severe poisoning, it won’t protect people when they eat small amounts of domoic acid over a lifetime. In 2008, biologists found that sea lions developed epilepsy from seafood contaminated with small amounts of domoic acid. Since then, scientists discovered subtle brain damage in research animals given small doses of domoic acid—doses that make scientists worried about domoic acid’s effects on Pacific Northwest tribal members, who eat lots of razor clams. But while the Pacific razor clam sticks to North America, its algal prey is more adventurous. Biotoxin-making algae love warmer water caused by climate change and appreciate the extra nutrients that run off growing coastal cities. In an unsettling resolution worthy of Hitchcock, Pseudo-nitzchia and other toxic algae are spreading, contaminating shellfish from the United States to Spain to New Zealand and putting humans and wildlife worldwide at risk of their toxic blooms.